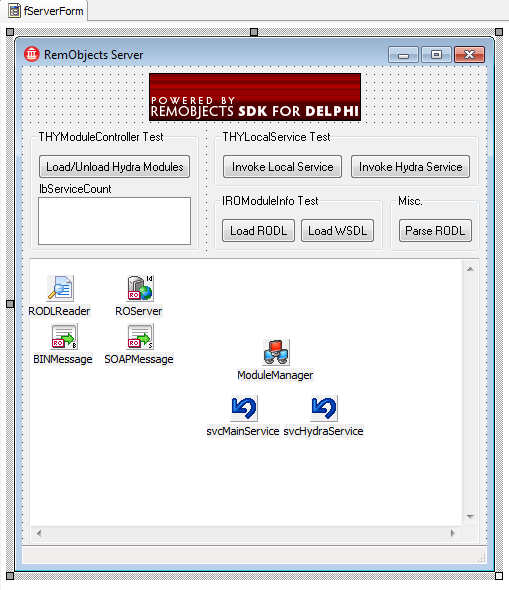 The RemObjects SDK Services sample demonstrates how to use Hydra to enhance RemObjects SDK services. In this sample we will show how to use Hydra SDK service plugins to dynamically extend server functionality and also use local services. 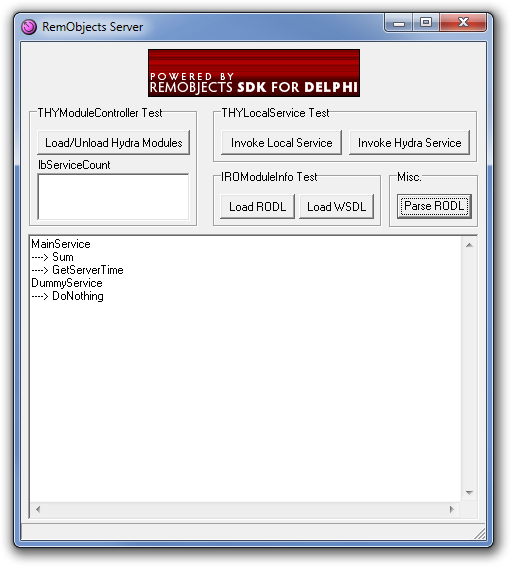 Please note that you will need the RO SDK for Delphi and the Hydra RO SDK integration package installed in order to build and run this application. The server application is a regular RemObjects SDK VCL server application that exposes two simple test services. 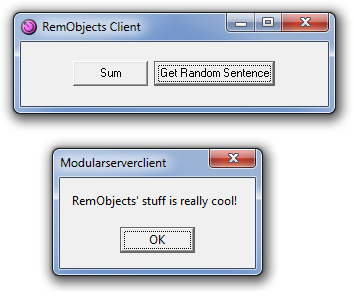 If you need more information on how to create an RO SDK server, please refer to the RemObjects SDK docs. Button2Click method - Using module manager, we are loading all existing dll's in a server directory or unloading all loaded plugins. This allows us to extend server functionality dynamically in runtime. OnGetRODLReader event handler - This handler assigns Hydra's THYRODLReader component as a custom RODL reader. This component allows our server to merge rodls from plugins into the main rodl. DisplayServiceCount method - This method uses a plugin descriptor to detect the number of service plugins. As mentioned earlier, the server also demonstrates how to use local services. The key component here is the THYLocalService class. This component is used for accessing any local service implemented in either the host application itself or in the Hydra module loaded by the host application. 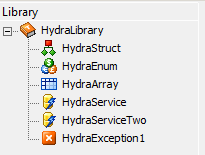 The first method works with a service that is exposed by the host itself; the second one is trying to access the dynamic service that is located in the Hydra plugin. As you can see, we are simply casting our svcHydraService and svcMainService, which are THYLocalService components, to the desired service interface and can then use this interface like a regular service. Also please note that THYLocalService provides the HoldsInstance property, which can show if we already created an instance of the service, as well as the ReleaseInstance method that can release a previously created instance. 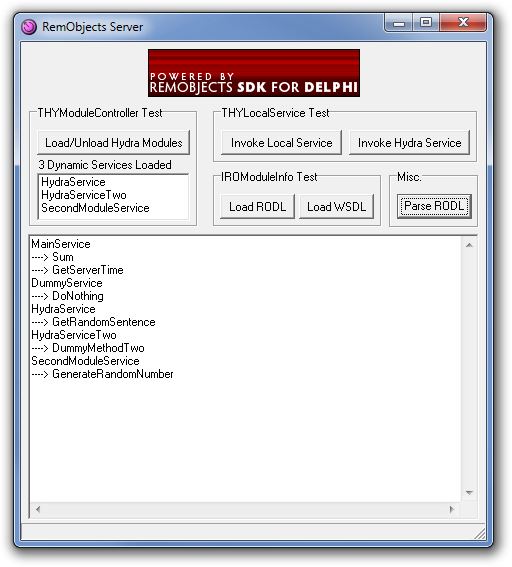 Our plugin is a Hydra module that holds an RO SDK service. If you need more information on how to create an RO SDK server, please refer to this article. Note: We are using a shared package to avoid possible issues with multiple types initialization. If the "_Intf" file is placed in a package that is loaded by the host, they will be initialized only once. As you can see, this is a regular RO SDK service, the only difference lies in the registration procedure – it creates a THYROFactory on top of the regular RO factory. Everything else is the same as in server: the services plugins can have multiple services, structures, etc. The client is an application that is able to access services exposed by our server. 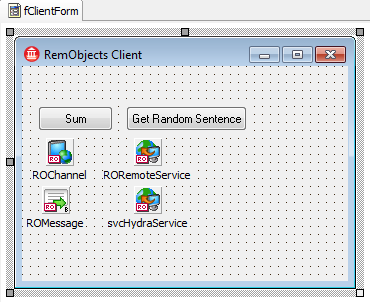 If you need more information on how to create an RO SDK client, please refer to the RemObjects SDK docs..